← Filming Sundance: Tradition, technology, and journalism collide. The moral responsibility of Settlers: What kind of society do we want to live in? As events unfolded today I kept coming back to one simple thought: the indigenous people across North America (and elsewhere) have done enough. They have offered up enough martyrs. They have protested enough. They have blockaded enough. There have been enough crises like those at Wounded Knee and Oka. They have done enough for contemporary Westerners like me to be held accountable for the society we allow to continue. Both Canada and the United States are settler colonial empires guided by capitalism. Devoid of any real meaning, our societies are based around unsustainable consumption. While this is rapidly dwindling the earth’s resources, it keeps us distracted enough from our existential emptiness to keep our societies rolling along. Because of this, large corporations have come to dominate our societies as they feed our perpetual hunger for energy, resources, experiences and diversions. With our consent or even encouragement our national governments enable these corporations to exploit anyone and everyone they can for profit. Justice and morality really do not matter as long as there is a supply to meet the demand. Where less aggressive but no less manipulative tactics fail our military and police forces ultimately step in and ensure that our companies have access to every resource and market in the world. Those primarily exploited by our societies are more often than not people of color, either at home or abroad. 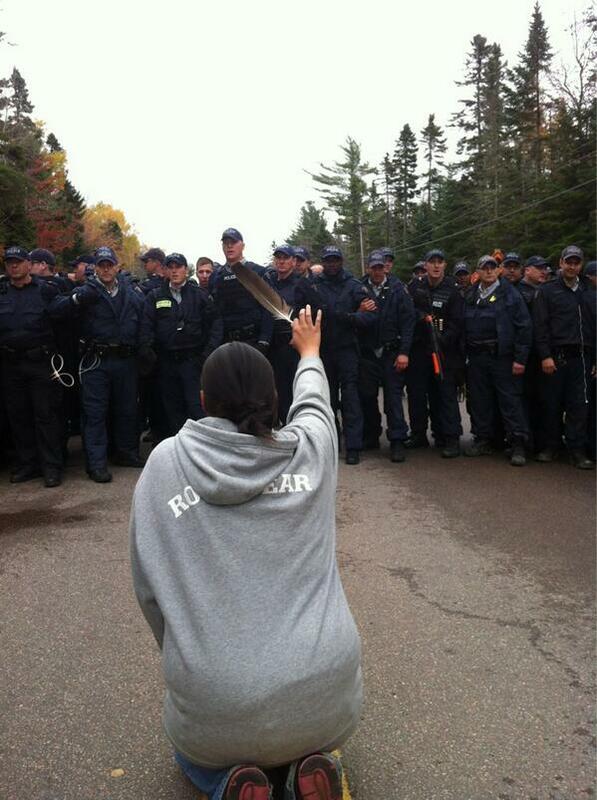 The conflict at Elsipogtog today, and on many other occasions, was a direct result of the protest of indigenous people against the larger forces that truly dominate our society that seek to co-opt, assimilate and otherwise exploit them. The unjust and immoral nature of our societies are sugar-coated under a thin pretense of democracy, nationalistic rhetoric and dishonest narratives about our countries. While false, these devices serve to give us a positive self concept of our nation. We believe lies so that we can feel good about being a Canadian or U.S. citizen. Now it is not human nature to question what we (and all those around us) have always assumed to be true. It is also not human nature to question our own positive self-image unless forced to do so. So, to a point and to a time, I think Westerners like me can be forgiven for not recognizing the problems in our society and addressing them. However, that point and time was at least several decades ago. The resistance and protest of indigenous people have provided more than enough to call us to self-reflection. We have read the names of enough martyrs. We have watched enough crises play out on the television. We have witnessed the disastrous costs of our foreign policy several times too many. We must accept moral responsibility for the unjust and immoral status quo of our societies. We have to recognize the blood on our hands. We can no longer employ propaganda that has proven to be false to alleviate our guilt. We may not be the ones directly exploiting others for benefit, but we are the ones allowing it to happen, we are the ones benefiting, and we are the ones who have no excuse if asked why we were not paying attention. We have to ask ourselves, “What kind of society do we want to live in?” If it is not the grim realities created by our settler colonial societies, we have to think and work towards change. This entry was posted in Politics, Postcolonial, Uncategorized and tagged Canada, colonialism, Elsipogtog, fracking, North America, The United States, Western Culture. Bookmark the permalink.